Originally published under the title "'Modernization' without Religious Tolerance in Saudi Arabia." 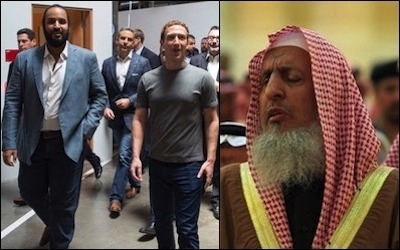 Prince Mohammed met with Facebook CEO Mark Zuckerberg in Silicon Valley last June. Three months earlier, Saudi Grand Mufti Abdul Aziz bin Abdullah declared that it's "necessary to destroy all the churches of the region." Bloomberg recently listed Saudi Deputy Crown Prince Mohammed bin Salman 42nd on its list of 50 Most Influential movers and shakers in finance. An Oct. 15 New York Times profile called him the "most dynamic royal" in Saudi Arabia, "a man who is trying to overturn tradition." Unfortunately, he's not trying hard enough. Prince Mohammed, 31, is the public face behind Saudi Vision 2030, a 15-year plan of regulatory, budget, and policy reforms unveiled in April. It is designed to build a "prosperous and sustainable economic future" for the kingdom by reducing dependence on oil exports and implementing a privatization program that will supposedly create a sovereign wealth fund of more than $2 trillion, the world's largest. Acutely aware of its growing need for Western capital investment and technology, the kingdom has shown small signs of reducing its horrendous violations of political and civil liberties, such as granting women limited suffrage, and improving government transparency. The Saudis are today even willing acknowledge the role their kingdom played in creating Al-Qaeda and other Islamist currents. "We did not own up to it after 9/11 because we feared you would abandon or treat us as the enemy," one senior Saudi official told Politico. "And we were in denial." But there is one area where no reform appears to be in the offing. As the kingdom embarks on a revolutionary project to reduce its dependence on oil and increase direct foreign investment, it does not seem to appreciate the importance of religious tolerance in a society trying to open its economy to the world. The Saudis don't seem to appreciate the importance of religious tolerance in a modern society. In recent weeks, the Saudi authorities deported 27 Lebanese Christians for the crime of conducting non-Islamic prayers, the kingdom's religious police ordered a clothing outlet to cover the U.K. flag on the logo of British International School uniforms because it displays the Christian cross, and a video surfaced of a leading Saudi cleric calling on God to grant mujahideen (jihadists) in Syria and Iraq "victory over the godless Rafidah (Shia Muslims) ... the treacherous Jews, and over the spiteful Christians" in a sermon at the Grand Mosque in Mecca. As William McCants of the Brookings Institution recently told Politifact, "official Saudi textbooks teach that Christians are seeking to destroy the religion and must be hated as a consequence." Despite the fact that 1.5 to 2 million Christians, mostly Filipino and other southeast Asian expatriates, live and work in the kingdom, Saudi Arabia is the only country in the world that does not allow the building of churches or even the open practice of Christian religious rites. Most expatriates live in loneliness away from their families and loved ones. Restrictions on their freedom to worship compounds this isolation. The Saudis can take advantage of poor Christian workers (and those of other faiths) because their remittance dependent governments lack negotiating leverage. There is a lot the West can do to pressure Riyadh to extend full religious rights to Christians. While there is little that labor-intensive Asian societies can do to pressure Riyadh to extend full religious rights to Christian workers, there is a lot that the West can do. So long as the Saudis depend on Western capital investment and advanced technology, the United States is uniquely positioned to press for greater religious freedoms for Christians and other non-Muslims. While it may be unrealistic to expect this from the White House, the U.S. Congress has shown greater willingness to challenge Saudi Arabia as of late. The Justice Against Sponsors of Terrorism Act (JASTA), which would strip away the "sovereign immunity" of foreign governments against terrorism lawsuits, has passed both houses of Congress, with the Senate overriding President Obama's veto last month. Another bipartisan bill was introduced earlier this month to block the recently-proposed sale of Abrams tanks and other military equipment to the kingdom until its human rights record improves. It's time for the United States and other Western governments to tell the Saudis that business-as-usual relations cannot continue unless their kingdom puts in place the building blocks of religious tolerance and pluralism. Saudi officials may bitterly object, but those who are fighting for real reform inside the kingdom need this ultimatum to win out over hardliners. Hilal Khashan is a professor of political science at the American University of Beirut and a fellow at the Middle East Forum. For more on this topic, see his article in the Summer 2016 issue of Middle East Quarterly.